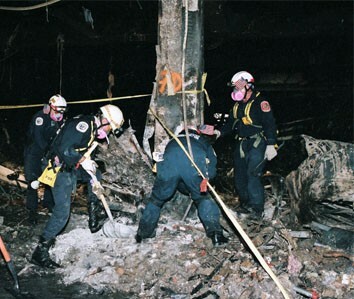 The pictures below show interesting wreckage pieces. A rotor (high pressure stage) coming from an jet engine can be seen. On the top left of the image, what seems to be the housing of this engine. On the rigtht, the leg of somebody working on the site gives approximately the scale. 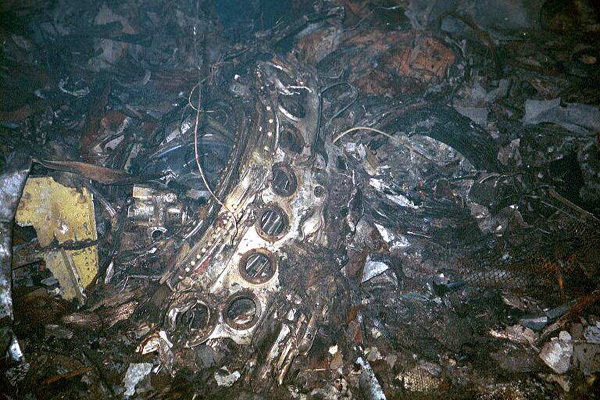 The photo above, taken inside the pentagon, shows some remains of an engine. It's difficult to have an idea of the scale. But a specialist knowing this type of engine should be able to recognize it : a lot of characteristic shapes are visible. 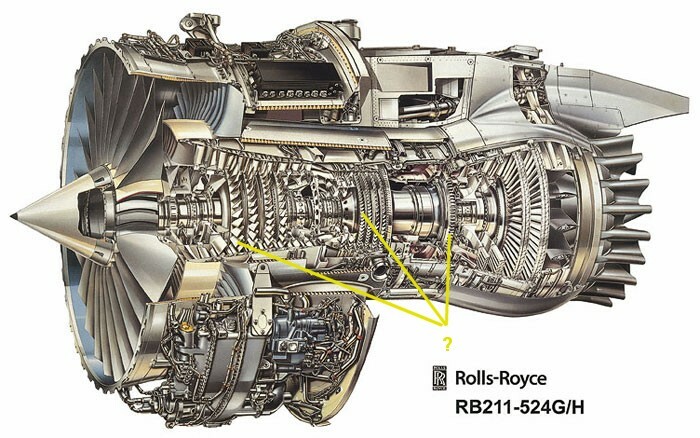 The two photos shown here above could be interpreted as two pieces (yellow references 1 and 2) in this sketch of a Rolls Royce RB 535 engine, the model which was mounted on the Boeing 757-200 number 644 AA alledgedly crashed on the Pentagon. Note that the rotor (1) is the entry fan or one of the internal turbine rotors of the high pressure stage, a piece which is not visible from outside. It is neither the low pressure fan (3), three times larger, located at the front of the engine, nor the exhaust fan (4), about the same size, located at the rear of the engine, both of these last pieces being visible from outside on a grounded plane's engines. The sketch above is an opened view of the Rolls-Royce RB 211 engine mounted on the B 757 of flight 77. 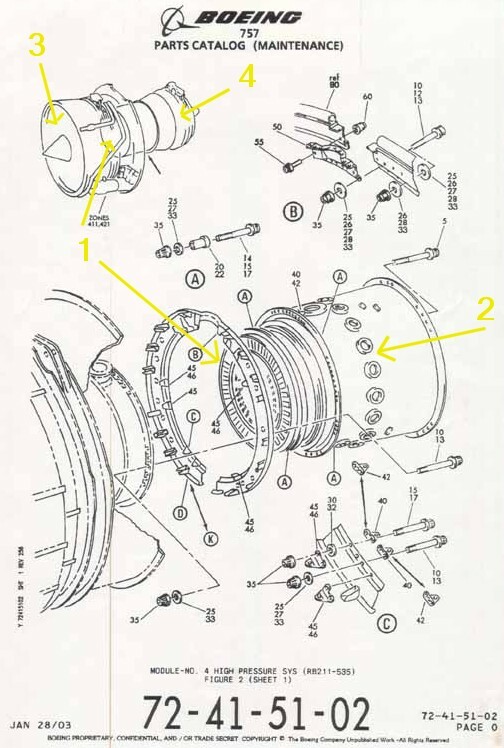 It is obvious that, if the big low pressure fan visible from outside the engine cannot fit the debris visible on the picture, several smaller rotors, inside the high pressure stage, have diameters and looks which fit approximately (yellow marks). This web site contains a complete analysis of this rotor, and concludes that it is a piece of a RB 211 engine mounted on a B 757-200. 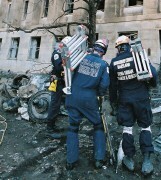 The photo above, by Jocelyn Augustino, shows urban search and rescue crews from Montgomery county working to clear debris and strenghten support inside the Pentagon. At the right of the picture, a cylindrical piece could be part of a reactor of the plane. It's place near pillar 7D is coherent with the path of the left engine inside the building's first floor. Other pillars (5E, 1H) could have been impacted and severely damaged by the other parts of this engine. The size of this piece, is around 1 m (three feet) in diameter. 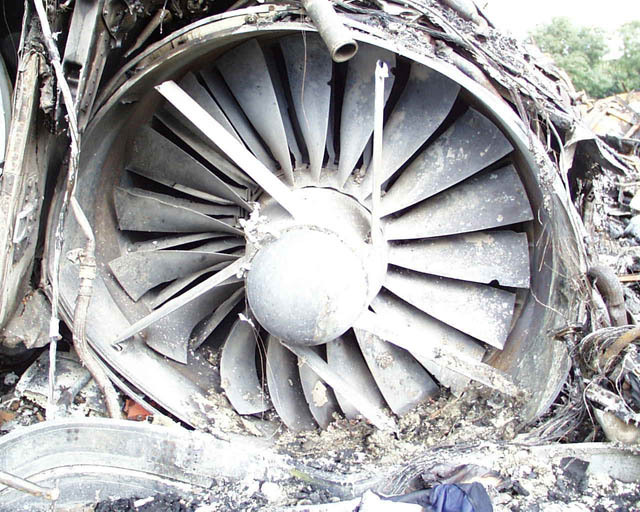 the cylindrical debris near pillar 7D has a diameter similar to this rotor's one. some witnesses heared a sound that they describe as the sound of a military aircraft (highly pitched and strident), not the sound of an airliner. Where are the others pieces of engine ? Why any other photos of these engines can't they be found ? either it doesn't come from a modern airliner, which would explain the strident noise, and the streamlining would be the external streamlining of the engine. or it comes from a modern airliner, like a 757, which has a high bypass ratio and low pressure fans of much larger size than the high pressure rotors, so that the streamlining would be located beetween the high pressure and low pressure stages. This could be confirmed by the engineers in Rolls-Royce or Pratt & Whitney, the companies which manufacture B 757 jet engines, or somebody from the company which manufactured this rotor. The rotor or the assembly of the last picture are really characteristic pieces : I don't understand, if they come from a B 757, that in any part of the world lot of people would't have already recognized them. Which web site will come first with a picture of this rotor or of the circular hollowed piece of the last photo shot at manufacturing or at maintenance stage ? See also the analysis and the documents presented in january 2004 by Richard Stanley and Jerry Russel on these engines debris. I received two different mails, following the above statements, sent by persons working in the aeronautics field. Both said that the rotor shown on the first picture of this page could be a part of the plane's APU. This acronym means "Auxiliary Power Unit". It is an auxiliary power generator, which is used when the plane is grounded and no external airport power source is available. It is always located in the plane's tail, with an exhaust approximately 6 inches diameter located at the fuselage rear ending. I asked these two persons if they could give more details on the particular APU fitted inside Boeing 757 planes, or if they could by some way recognize this particular rotor piece, but they couln't. I have absolutely no reason to suspect these two persons of being dishonest. Recently (sept. 14), Christopher Bollyn, journalist, posted on "rumormillnews" web site a message asking, as I do, why this rotor has never been officially identified, along with some other "smoking gun" questions. Joe Vialls, an english aeronautics engineer, answered this post, with a link to a web page on which he put two pictures. Here is a copy of this answer and the pictures. Date: Sunday, 14 September 2003, 8:20 p.m.
"A Boeing 757 has two large engines, which are about 9 feet in diameter and 12 feet in length. A Pratt & Whitney PW2043 engine, used on some 757 aircraft, has a fan tip diameter of 78.5 nches. Nothing this large is to be seen in the FEMA photographs." Sure, but all Boeing 757 aircraft also have a large jet-engined auxiliary power unit mounted in the tail, used to drive cooling and other systems while on the ground during main engine start etc. Flight 77 was fitted with a Honeywell GTCP331-200 APU, which is just about dead right for the picture posted by Christopher Bollyn. These three pictures show, in my opinion, that the rotor shown on the picture of the pentagon's debris cannot come from the Honeywell APU shown on the pictures posted by Joe Vialls. The diameter of the debris shown is beetween 2 and 3 feet (60 and 90 cm), probably around 2'6" (75 cm). The size of the rotors inside APU shown on the pictures is beetween 8" and 12" (20 and 30 cm). The only possibility for the sizes to fit would be that the FEMA worker on the debris picture would be a dwarf one half the size of a normal person and the person working on the APU on the workbench would be a tall "basket ball champion sized" person. The appearance of these two persons is normal and they seem both to be normal males with a size beetween 5'6" (1.70 m) and 6'6" (1.90 m). Thanks to Joe Vialls for the proof.